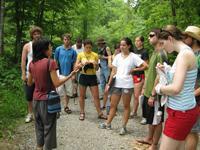 Students in the Human Ecology of the Southern Appalachians Summer Field School take a tour of an ecovillage outside Asheville, North Carolina. 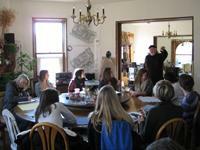 Students in the St. Louis Intentional Communities Research Group learn about cohousing at an emerging cohousing community in St. Louis, Missouri. This quote from one of my students indicates the impact that visits to intentional communities have on students in higher education. As an anthropologist and environmental studies teacher, I believe that providing students opportunities to experience intentional communities is an excellent way to explore the nuts and bolts of sustainability and participate in positive social transformation. This short article explores my experiences in this area and presents a call for communitarians and academic researchers to come together for a broad discussion about connecting communities, students, and academic institutions for sustainability education and transformation. In the two years after finishing graduate school in 2007, I taught about intentional communities mostly in the abstract. I gave brief lectures on them in my introductory anthropology courses and even taught a one-credit freshman seminar on ecovillages. Throughout, most students did not show the greatest enthusiasm. A topic that held my attention for 10 years was not captivating for my students. This began to change during summer 2009 when I co-taught a field school on the human ecology of the Southern Appalachian region during which we took students to visit a number of intentional communities. These visits came on the tail of several weeks spent learning about transformations in human-environmental relationships in the region over the last millennium. These transformations tended not to be positive in nature. From European colonialism and its effects on native cultures and landscapes to industrial-scale timber harvesting and mountaintop removal coal mining to the decline in agroecological diversity in the region, a series of negative scenarios confronted us. While it was exciting to immerse ourselves in the landscapes and communities in which these changes occurred, the experience was not particularly uplifting. However, we also wanted to bring to light positive trends in the region: Cherokee cultural revitalization, an elk reintroduction program, renewable energy projects, local and organic food movements, and intentional communities. Moving roughly chronologically through the environmental history of the Southern Appalachians, toward the end of our itinerary we turned our attention to groups of people attempting to reinhabit this place. At this point, the tone of the course and the attitude of the students began to shift. Perhaps it was my own enthusiasm. My knowledge about the region was rooted in my long-term relationships with several intentional communities there. I think that seeing and talking with groups of people engaged in deliberate endeavors to change their relationships with each other and with the surrounding environment provided a sense of positive possibilities. Learning about the communities was challenging as well. How could people choose to share ownership of land and other property with so many other people? How could people be willing to sit in meetings discussing minor details for so long? How could people put up with not having cell phone access 24 hours a day, seven days a week? These seemed contrary to what students expected from life. Students were also challenged by the practical, daily realities of community life. We spent 48 hours at an ecovillage and during that time, I was the only one to use the composting toilet. Students yearned for a “real” shower. Bathing in the creek didn’t do the trick. Still, I could see that these experiences began to open up new possibilities for them. Simply seeing that other people could do something different was empowering. Fast forward to spring semester 2010. A colleague and I received a small grant for research on intentional communities. The grant was part of a larger, campus-wide project that aims to determine how research, public policy, and citizen action can combine to contribute to more “livable lives” in the region surrounding our campus. Recognizing that intentional communities are inherently formed in pursuit of lives more livable, we believed their endeavors should inform the larger project. Rather than simply writing a report or doing library research, we decided to get our students actively engaged with some of the intentional communities around campus. We wanted them to experience the transformative potential intentional communities hold and to use their fresh perspectives to help us bring this potential to light. We chose to use appreciative inquiry to engage community members in discussions focused on the most positive aspects of their communities. Following on the idea that intentional communities are creating the change they wish to see in the world, we ask mostly about not the problems that local communitarians are responding to, but the solutions they’re creating. Our research focuses on community members’ experiences of the ways in which community living contributes to things like increased economic security and social support, a better sense of health and well-being, and reduced ecological footprints—all essential components of any transition to a more sustainable society. While our goals could be achieved through reviews of the growing academic and community literatures on these topics, the quote above suggests that facilitating direct student experiences of intentional community holds much greater potential power. A whirlwind tour of five local intentional communities at the beginning of the semester was the students’ introduction to community living. Student responses to this tour reflect the power of this experience. Students were clearly inspired by the positive and moving examples presented by the communities we visited. In a world increasingly filled with bad news that can overwhelm one with a sense of powerlessness, intentional communities reverse this dynamic. Intentional communities were seen as a manifestation of the potential good in the world. We visited communities dedicated to serving the homeless and others in need. We saw a variety of communities struggling to meet their goals and recognizing that the process of striving for something better is as important as actually getting there. Perhaps most powerfully, we encountered groups of people who care deeply about each other and about the places in which they live, people who were not afraid to speak openly and with emotion about these things even in the midst of a group of strangers. Our all-day tour was long and tiring, but subsequent discussions indicate the students clearly took a lot from it, including a better understanding of what intentional communities are all about. Students are now excited about their research papers and projects and don’t seem to need much prompting to get the work under way. Each student has selected a particular community to research in greater depth via frequent visits and interviews with community members throughout the semester. Perhaps more importantly, students are engaging these communities on an intensely personal level and contributing to the broader process of social and cultural transformation. Sustainability is clearly not just about new technologies that enable us to use natural resources more efficiently. Nor can sustainability be achieved through research and public policy alone. Moving toward sustainability will require broad cultural transformations that can be brought about only as people reengage with each other intentionally in local communities. My experiences over the last couple of years suggest that actively connecting students with intentional communities holds great potential for helping to initiate the kind of societal transformation that a quest for sustainability entails. I know there are many others out there who share my sentiments and who may have much greater experience with this topic. I would like to suggest that we create a forum where we can share our experiences and support each other in furthering the transformative potential inherent in engaging higher education students with community living. Perhaps we could come together at the Communal Studies Association annual conference for formal and informal discussions. Fellowship for Intentional Community events may provide appropriate venues as well. I am open to other suggestions. If you are an educator, communitarian, activist, or student who is interested in strengthening connections and increasing opportunities for interaction among communities, students, and academic institutions, please contact me at jlockyer AT (replace with @) wustl.edu.